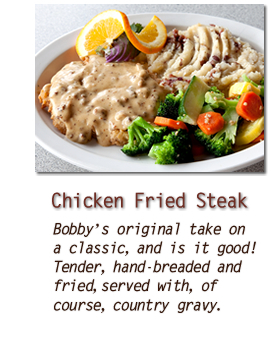 Bobby’s Hideaway Cafe has been a local favorite restaurant since 1995. Our menu offers café cuisine prepared with quality ingredients served at diner prices in generous portions. While we have a great reputation for chicken fried steak and other folksy comfort foods, our char grilled fish, Certified Angus Beef ribeyes, and fall-off-the-bone ribs are comparable to meals you'd get at an upscale steak or seafood restaurant. While Bobby's surprises many hearty eaters and sophisticated diners alike by being so much more than a "country diner," we’re neither stuffy nor stuck up. Our vast menu features ample choices of quality, fresh made meals served in a laid back family dining atmosphere. Besides the great food, we're also noted for our pictures of famous Bobs lining our walls. But we also feature a gallery of “Not So Famous” Bobs who’ve dined with us. Either way—our food is noteworthy, our dining room staff is friendly, and if you're not named Bob, we'll still heartily welcome you! 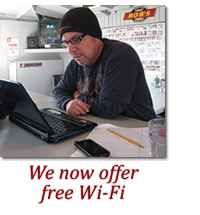 Copyright © 2012 Bobby's Hideaway Cafe. All rights reserved.